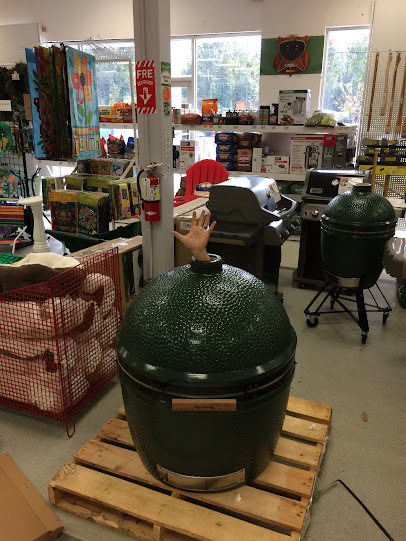 The BGE or Big Green Egg! About six months ago we got an order for an XXL BGE. If you have never seen one of these things, they are enormous!! Weigh in right at about 400lbs. The dude in this pic is 6' 3' for reference. See the hand sticking out the top on this one? Only one we have every sold... As would be expected for 4K!!! I have a small that has traveled with me for over 5 years. I would like a mini max as it is shorter and lighter than the small But has the same cooking surface area. Well I don't know what your problem is but I have years of experience of using the BGE and have no qualms about using it 3 feet from my coach. It is certainly far safer than the gas grills the love to hand off the side of RV's these days. We have one with a table built for it and I can say that I am an "Eggspert"
So I guess you don't have an oven? And and engine too, which all happen to be made to be used where they are installed. If you all want to use your egg next to your MH go right ahead, I see no reason to do so, and will not which is my choice and is my recommendation to others who are certainly free to do what they want to do. As for the mega egg picture above, it appears that some cannibals we're sizing up a BGE for thier next meal! 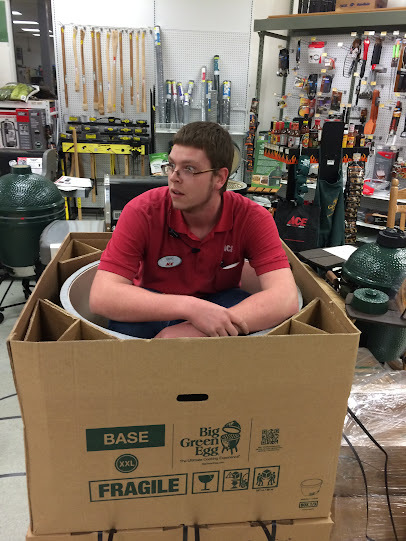 Betr2trvl, it is obvious you do not have any experience with a Big Green Egg. You can place your hand on a BGE with it at cooking temperature and not be burned. The ceramic insulates it that much. What about all the gas grills that hang on the side wall of thousands of RV's with the LP quick connect right below it? Or all the high dollar motor coaches with the slide out burners and gas grills? If you read my first post, we do have one, and love it. No one is going to convince me it is a good idea to use one next to thier MH, isn't going to happen. Nor, do I see any correlation between a stove, oven, or gas grill that has been made to be used where it is installed. If you want to put your hand on ours when it is 600 degrees while we are cooking a pizza, I get to count to 10. So let it die, will you please, and let the thread go back to being all the good things about cooking on a BGE. Thanks. Ok just for informational purposes for those who are not familiar with the BGE and might be interested in one, can't speak for other Kamados, I am cooking right now, doing food for the family to take to the condo. The BGE has been at 350 degrees for 3 hours in 90 degree Florida heat. I got my tape measure out and got to 9 inches before I felt slight heat. My large BGE has been in a wooden table for 5 plus years and used at least twice a week during that time. The edge of the hole, only 1/2 inch away from the side of the Egg is not even scortched even though I cook steaks at 500 degree's. If you don't mind carrying and handling the extra weight the BGE is close to unsurpassed for grilling and smoking food.